So I think enough reasons to decide to go ahead with the training! I was already so far to start with the night VFR training, when I spoke to the training center again and discovered even a better option: ‘Basic Instrument Flight Module (BIFM)’. The BIFM forms a part of the instrumental flight rating course and you basically learn to fly without external visual references. During the course you practice horizontal flights, climbing, descending, turns in level flight, climbing, descending, recovery from unusual attitudes, stalls, etc. It takes 10 flight hours to acomplish this course after which a certificate will be isued. If you decide to finish the IR course, you have already done the first 10 hours, and you just continue with the missing 45 hours. I am doing the training at Canavia, and as the school is situated on the other island, to reduce the costs for moving around I try to do 2 missions at once (of total 10 missions). As I am only VFR rated, I always look out the window for nice weather conditions. On the Canary Islands, you can basically fly 360 days in a year and just today, on the first training day, the weather was really not the best one ç(IMC conditions); a lot of fog and low clouds. I phoned the FI to ask how he sees the situation and his answer was: “Perfect, as we are going to fly IR!” Wow, under normal circumstances we would have to cancel the flight. As I knew the training should be done on a VFR rated aircraft (Tecnam Sierra), it sounded a bit strange to me to be flying without any references. However, I have done my PPL on this plane and it is equipped with a artificial horizon (very very helpfull) and a Garmin 430 as well (which we won’t be using during the flight), and VOR/ILS. After I arrived at the Gran Canaria airport, where the school is situated (very recommendable, as they have very sharp prices and a good fleet), I’ve learned my FI Yeray, and after finishing necessary paperwork, we went down to the general aviation parking and started the preflight check of our Tecnam. Last time I flew on this ‘light aircraft’ was about 6 years ago and it is a bit different to fly a light plane like this in comparation to the Piper or Cessna I am normally used to fly. The first big difference after we left the airport was, that I had to start focus on the instruments inside without looking outside at all! Checking the horizon, heading (on the compass turns to the opposite direction than the gyro) and follow the outgoing radial of the VOR. It was not necessary to wear the hood; there was nothing outside you could see! Fantastic weather to practice the flight! The flight instructor used the conditions to skip a couple of lessons and to practice a stall and recovery from unusual situations. I had to look outside and he putted the plane in a turn and descent; my task was to recover it by looking on the artificial horizon. 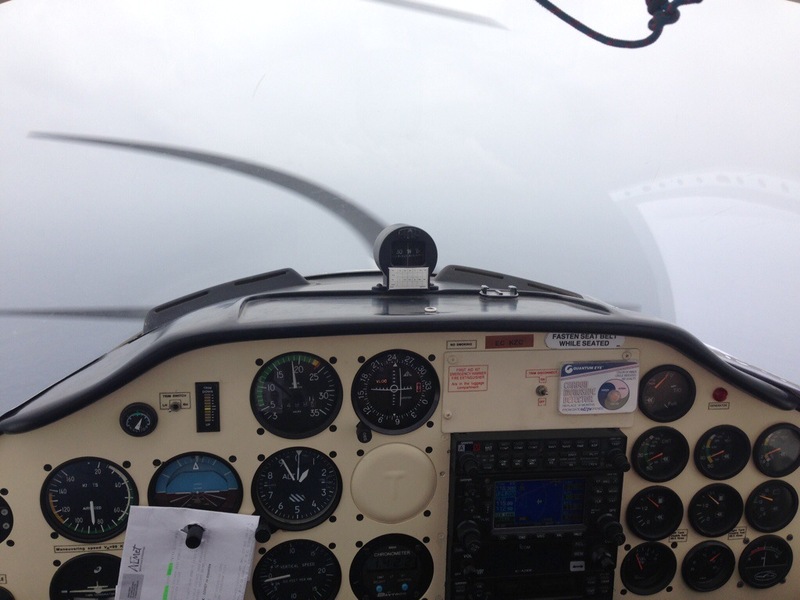 Stalling the plane in normal conditions looking outside feels different than with no visual conditions. You actually do not realize that the plane is stalled, the stall horn warns you and you see it on the instruments. Flying with no references requires pretty much concentration than flying around in a nice VFR weather, and I was actually pretty exhausted after this ‘short’ (1:40 min) flight. I am sure that the autopilot is a big help in this conditions. Besides this, I had to pay more attention to fly a plane I was not used to fly normally, and the turn coordinator was not working, so it added an additional work load to me. In the next missions we will train fault of some instruments as well, so it was not bad to fly like that. But maybe to many things together at the beginning. The good think is that I have recorded the flight as well, so I can reproduce some of the manouvers in order to improve myself before the next mission starts. And this will be soon as well, so I look forward to the next training flight!